This activity can be done in 2 full days or three days for a more relaxing tour. In El Calafate, we will enjoy a wonderful visit to Perito Moreno Glacier. El Calafate is 80 km from Perito Moreno Glacier along a paved road (50 km.). The last 30 are within Los Glaciares National Park. During the first 40 km you travel through the Patagonian steppe. Then, once you enter the National Park there is a noticeable change in the vegetation, now basically formed by nires (nothofagus antartica), guindos (nothofagus betuloides) and lengas (nothofagus pumilio); some isolated canelos (drimys winteri) and many colored flowers, among them the intense red colored notro (embothrium coccineum), the typical flower of the Andean Patagonian Forest. Once at the Glacier, the visitor is overwhelmed by the impressive spectacle and can appreciate the many unforgettable vistas of the glacier from the walkpaths. There is a restaurant, a snack bar, restrooms and a pay campsite within the Moreno Glacier area. This is a full day excursion. Rios de Hielo Express let you enjoy the glaciers of Argentine lake by boat, in a full trip of 6-8 hours. 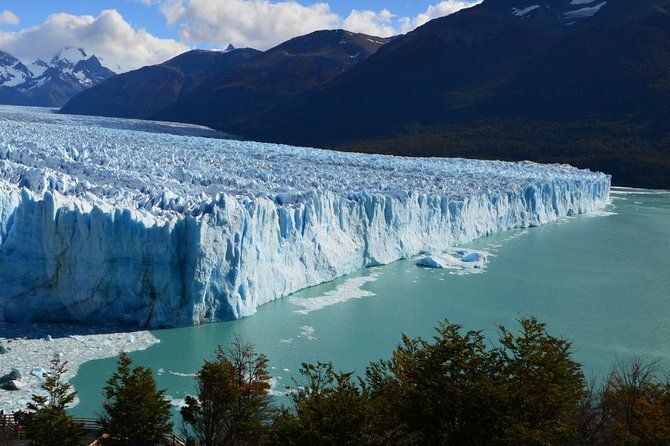 This is a perfect trip to complete you visit to the Perito Moreno glaciers, because it let you see the natual landscape very close to it. Rios de Hielo is a amazing activity that you have to do while you are in El Calafate. This excursion will start when we pick you up from your hotel, to take you to the Tierra del Fuego National Park; this is located just 12 km away from the city of Ushuaia. When we enter in the park, you can take the Train of the End of The World. The train is optional in the excursion to the park. Once in the park, you are going to see different species of vegetation for our pretty characteristic forest, something as bushes, beech trees, ñires, Indio’s beard and flowers in an extension of 63.000 hectares. During our trip we will make different stops, to enjoy the panoramic views and take pictures. From there, we are going to go to Verde Lake and then to Lapataia Bay, places where you could see beaver dams and peatlands. On our way back, we will stop on La Roca. Finally, a wonderful Beagle Channel Boat Navigation: We will start from the port, and then we will stop on “De Los Lobos” and “De Los Pajaros” islands, to see Sea Lions and Cormorants. After this, we are going to go to “Les Eclereus” Lighthouse. While we are navigating east, it will possible to see incredible views of the Channel and the Mountains.